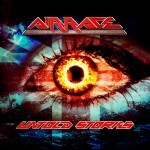 Share the post "Album review: AIRRACE- Untold Stories"
A third Airrace album in their off-and-on 35 year existence looked unlikely when guitarist and band leader Laurie Mansworth put the band on ice a few years back to concentrate on managing The Treatment, and even less so when soon after a new line up came together, Keith Murrell departed. His high-pitched vocals were a big part of their sound and with Laurie now the only original member I was unsure what direction and focus a new album would take. The overriding impression here is the album has a real feel of the late seventies and early eighties, giving it a warmth that many of today’s current melodic rock releases lack. ‘Running Out Of Time’ begins in promisingly grandiose fashion with a lengthy piano and guitar intro, and that promise is realised as Linda Kelsey Foster’s keyboards and Laurie’s guitar do battle, while new Welsh singer Adam Payne’s voice is a revelation, crystal clear and backed by harmonies in a manner which calls to mind Styx. ‘Innocent’ is more classic straight down the line AOR but with an added Lizzy-like double tracked guitar solo, while ‘Eyes Like Ice’ had already been a live favourite and is a grower with its haunting keyboard riff and an impressive bridge almost as catchy as the chorus itself. ‘Different But The Same’, a title which perhaps sums up the new Airrace direction, is an interesting number in several phases – initially based around a strong, simple riff that owes much to Zeppelin and Aerosmith, an unexpected keyboard break then leads into Laurie releasing his inner Blackmore, a vibe that persists into the next song ‘New Skin’. The middle of the album rather dips in pace with the lush, soft balladry of ‘Lost’ and on ‘Love Is Love’ an otherwise rocking number that reminded me of early Foreigner was spoiled by a saccharine chorus. ‘Men From The Boys’ has perhaps Airrace’s heaviest yet riff, leading into a golden trio of closing songs with ‘Summer Rain’ having a breezy, laid back seventies theme, with another strong bridge, and not the only song drawing comparisons with current contemporaries Cats In Space. ‘Come With Us’ is a joyfully swaggering, up-tempo anthem and Laurie’s guitar powers closer ‘Here It Comes’ in almost power pop fashion, while throughout Adam has the versatility to match his voice to the diverse variety of styles on view.. This entry was posted in ALBUM REVIEWS, ALBUM REVIEWS (Mobile), All Posts and tagged Adam Payne, Airrace, album, AOR, Laurie Mansworth, Linda Kelsey Foster, melodic rock. Bookmark the permalink.